This is quite a trivia to start: posting a comment on a review I wrote for “Saman”, an user from Facebook said “Hildur is Iceland”. He then explained better, but I concentrated on the sentence, because I agreed with it and I still don't know exactly why: probably there is not a singular reason, while a lot of! What do you think of this? Connecting with this, what is your relationship with your homeland? I do very much love Iceland and my people there, but there are also things going on there that I absolutely do not agree with. I have not lived there for about a decade, and seeing how the country is currently being run, I don't think I'll be moving back any time soon. In the past, I had the chance to interview a lot of Icelandic artists. When I asked them about that kind of magic that seems to sorround everything from that island – from people to landscapes and photos, including music too – they most of the time replied saying that it's something not so real, it's one of the secrets behind Icelandic artists succes but it actually doesn't exist. Do you agree? I think all artists from Iceland get exactly this same question in every single interview we do, and I don't really have an answer to it. I don't think we see ourselves as mysterious in any way, this is an image that is created abroad. In fact I think it's highly unlikely that anybody can view himself as being mysterious, because you are with yourself all the time... I can see that it is strange from the outside that there is so much art coming from such a small place - but when you start looking in to it, it's a lot of the same people rotating around a large number of bands! More in general, what do you think about this european spread of Icelandic-coming music? I think it's very important for musicians to play outside of Iceland, to broaden peoples perspective. I think it's important for all people to travel to understand the world a little bit better. Start talking about your last work, “Saman”: I readed it is a sort of researshal on the concept of resonance. How have you worked it out? Can you explain it a bit better? The human voice and the cello have a very similar frequency range, and I find it fascinating to try to mix them together so they really merge into each other as one. The interaction between sound and voice has always been part of your music as a solo artist. But there, it seems to have gained again more prominence, hasn'i it? Yes this is true. On my last two records the voice is more in front than it was on the previous records. I think I have a stronger urge to use words now, that´s one of the reasons for this. I noted also a very dark and oppressive climate, probably due to the large use of atonal sequences. Is it a consequence of the album's researches on resonance and sound dialouge, or it takes part in a precise stylistical choice? I don't really think in terms of stylistic choices when I compose. In later years my music has perhaps become a little more atonal, but this is not because I am feeling dark or depressed. I am in fact pretty happy most of the time! What does the album “talks about”, in terms of words and titles? The title means something like “together”, doesn't it? Yes it means together. It refers to the blending of cello and voice. But the record also speaks of coming home, and being at home in your own skin. Finding peace with yourself. I found it quite difficult to link the album cover – that seems to suggest a much more environmental release – to the music and the experimental nature of the project. What does that photo represents? You will have to ask Jon who took the picture about that in more detail. But I thought he captured the nature of the record quite well - the blending of two different elements, water and vegetation, and the lines between them being blurry and distorted. So you ask yourself, where does one thing begin and where does it end. In my case this question refers to my two main instruments, where does my voice end and the cello take over. It seems to me that you concentrated a bit more on the experimental side of your music, and a bit less on the imaginary one. "Without Sinking", for example, was probably a less elaborate work but a more “emotional one”. Do you agree? What are, in your opinion, the main differences between “Saman” and your previous albums? I don't really agree with that one, no. I think "Saman" is actually probably a bit more emotional if you want to set it up like that. Because there I am expressing highly personal experiences in words. "Without Sinking" is a bit more open to perception. But otherwise I find if hard and not so important to compare the the records. They all express what I am feeling that moment. It is unlikely that you wake up in the morning and think - ah today I feel like this because I felt like that 10 years ago! What role does the cello play in your music? Is it the instrument you use to compose with? It plays a huge role in my music. It is the instrument I have played my whole life, so it is a huge influence on how I perceive music. And of course also how I write music. I compose with it sometimes, but not all the time. And what other instruments, adding to cello and your voice, do you use in your works? What ever is at hand really. Harps, pianos, other string instruments, vibraphones and of course the computer. Two years ago I was literary shocked by "Leyfðu Ljósinu", an album that in my opinion is your best work to date. That was just a 40-minutes piece completely improvised, wasn't it? All of your albums have come out on Touch. How do you arrived to their catalogue and why have you always chosed them for publishing your works? I got to know them through my good friend Jóhann Jóhannsson. He sent them a demo of my first album without my knowledge, and Mike (from Touch) got in touch with me and was very keen on releasing it. The time was not right at that moment, but we decided that the next one would come out on Touch. I really like working with them. They are wonderful and honest people. I trust them completely and feel at home there, so I see no reason to change that. There are a lot of dodgy people in this business, and I have it as rule not to work with people that I don't know and trust. And what about múm? You started playing in their works as an external musicians, but then it seems you have been involved into the full group's activity. Are you still working with them? I have played with them since before múm was even formed. I grew up with them and love them like siblings. Yes, I am still working with them. Me and Örvar have plans for our band we will have in our retirement home, so I think I'll be working with them till the end of our time, in some shape or form. What do you think you have brought to their sound, or attitude, and what instead they gave to you? I guess maybe I brought some playfulness. They took a pretty steep musical turn with "Go Go Smear The Poison Ivy", which is when I joined the band full time. They had already written the music, so it's not that this turn happened because of me. But because we have been friends for such a long time, so it probably excited the playfulness in all of us to be hanging out and laughing our asses off every day. There are some heavy duty bad jokes circulating in this band all the time! They have given me a lot, more than I can imagine how to explain in one sentence. How do you usually build up your performances? Are you working on a new one for “Saman”? 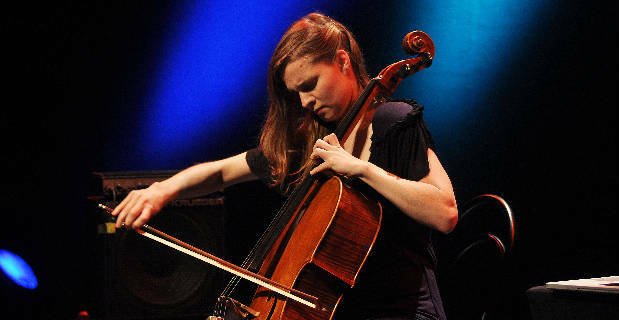 My performances usually consist of cello, voice and electronics. I am playing quite a few shows this winter, including material from "Saman", but also even newer material. I am working on lots of things. I am developing a really exciting new instrument with a good friend, Hans Jóhannsson. It´s a kind of electro acoustic surround cello. I am also starting to work on a new stage performance, something in a line of an opera of some sort. I am also working on some film music with my good friend Jóhann Jóhannsson. And lots of other bits and pieces of this and that. Un’immersione nell’impalpabile densità delle nuvole, sulle note del violoncello dell’artista ..